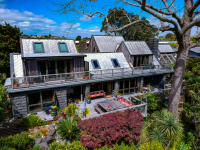 Matua Lodge incorporates every contemporary comfort and modern technology. Windows and doors slide back for flow to outdoor entertainment areas which enjoy the spectacular views of the harbour to Mt Maunganui. The guest rooms are spacious and luxurious, each with their own private bathroom. Original generation time 1.6652 seconds. Cache Loaded in: 0.0354 seconds.